Due to recent spikes in temperature, there will be some speed restrictions on sections of Metro Rail throughout the week. Speed restrictions are precautionary measures during extreme weather conditions to ensure we do not cause damage to the tracks or overhead power lines. Possible delays on Gold Line, Blue Line, Expo Line and Green Line where power zones are strained or under extreme heat. Trains may arrive several minutes behind schedule and also take longer during the ride. Expect crowded train cars. Train doors will be on passenger release mode at terminal stations to keep train interiors as cool as possible. Use the door-adjacent button to open doors. For up-to-date service advisories, follow our Service Alerts Twitter at @metrolaalerts. protect against sunburn — SPF 30/PA+++ is your friend! How does Dallas light rail operate in 112’F temperatures with no restrictions? I can’t speak to Dallas, but one of the challenges Metro deals with is the range of temperature differences a train may travel through on a single run. 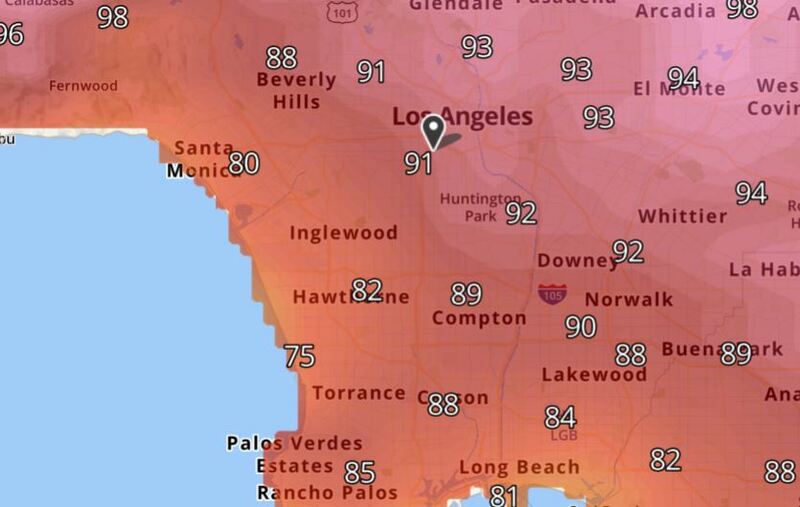 For example, the Gold Line travels from East LA to Azusa, and there can be more than a 10 degree difference in temperature during an extreme heat event. As the temperature changes, equipment contracts and/or expands at different rates, so we take the precaution of running trains a little more slowly to make sure no damage is done and everyone can travel safely. “Trains may arrive several minutes behind schedule and also take longer during the ride. Expect crowded train cars.”… so how is that different than any other day, exactly? Look, I understand the issues that Metro has to deal with during the heat wave. However, Metro staff have the responsibility to do whatever they can to mitigate and minimize the impacts of these service issues on their customers. While some things are out of your control, other things can and should be controlled. This morning I arrived at the Culver City Expo Station at 9:42, one minute before the scheduled departure time for the next eastbound train to DTLA. Unfortunately, the train had arrived two minutes early (or more likely, 10 minutes late), so I missed it, and I saw that it had already reached the next station (La Cienega). No big deal, Expo runs every 12 minutes, so the next train should be arriving within the next 10-12 minutes. So I checked my cell phone app, and I saw that the next eastbound train had just left DTSM, and wasn’t scheduled to arrive in Culver City for another 18 minutes, so there was a gap of 21 minutes between trains. Of course, when the train finally did arrive, it was packed because it had to pick up all of the passengers who (like me) had missed the previous scheduled train. Further, I checked my app again and saw that the train that I had missed earlier was now running hot by three minutes, and it was then following within five minutes of the train ahead of it. This is inexcusable! Metro dispatchers and train operators have the responsibility to adjust their priorities during service interruptions such as these. The dispatchers should hold train departures in order to maintain proper spacing, and operators should operate at consistent speeds to avoid bunching. Frankly, there seems to be little to no supervision of train operators/drivers by MetroRail Management, to achieve on-time performance (or at least close to it). In my almost daily experience (including weekends) with various MetroRail lines, the actual train arrivals/departures at stations are no more predictable than are buses relative to schedules at bus stop timepoints. One would expect that each train on a particular line would encounter similar conditions to those encountered by the trains immediately ahead of, and behind, it. Certainly, one would not expect that one train would be significantly earlier than the scheduled time at a stations (causing one to miss it), while the very next train is MUCH later than the scheduled headway (never mind the actual scheduled time)–yet that is exactly what happens, almost every time I ride ANY MetroRail line. Part of the explanation, in particular after the middle of the evening (circa 9:00 p.m.) when even the SCHEDULED headways for all rail lines expand to 20 minutes, is that train drivers so often fail TO START their runs on time from the originating station–even in cases when that train completed its run into that end-of-the-line station in plenty of time to unload all arriving passengers and load up with all new passengers waiting for the run in the other direction. If/when there actually is an unavoidable OPERATIONAL reason for delaying a train’s departure from the originating station (especially in periods when even scheduled headways are 20 minutes), why cannot Metro employees disclose that information IN REAL TIME to the passengers? After all, every train and train platform (and bus) has a P.A. system. If, on the other hand, the train driver simply doesn’t feel it is important to start the train’s run on time, why cannot his/her supervisor do something about that–even after the fact? Again, this problem of late beginnings to train runs is especially problematic later at night–when most passengers are eager to get home, and the problem is exacerbated for passengers who have to take a connecting bus (which actually might be ON TIME, but are probably operating at even larger headways at that time of night) to get to their homes from their destination rail station. Even since Metro’s drastic cutbacks on the frequency of train service after the middle of the evening that took effect a couple of years ago, any trip later at night that requires use of more than one Metro train or bus line has become a total gamble. Just a single late (or early) Metro train or bus connection can throw a passenger’s most careful trip planning totally out the window, resulting in subsequent missed connections and adding to greatly to travel time to one’s ultimate destination (often one’s home)–simply because the headways are so great (trains/buses for INfrequent). I no longer can recommend to any of my (middle-class) friends that they try to rely on Metro for transportation home from an evening play, concert, lecture, or other night-time entertainment venue. Of course, that implies that they also will have to take their personal auto TO that evening entertainment venue, adding yet another auto to the evening “peak-hour” traffic. It seems to me that the lack of supervision is a major source of Metro’s operating problems. @burbox Hear hear! I love Metro Rail, but it’s operation is very much a mystery to me. I cannot make any sense of the ‘unexplained’ delays, and the lack of information from drivers and dispatchers is a big part of the problem. A good example is the evening train to Long Beach. Often it will say “Long Beach” (not “Del Amo”) on its display when I get on, but then at Artesia station, we will find out that Del Amo is the final stop. Now I understand trains going out of service at the yard, or people going on a lunch break. But I find it hard to believe that Metro staff can’t know this and tell us this in advance. Maybe the lack of communication is due to the lack of supervision. Who knows. But it’s very frustrating for this seasoned daily rider. I can only imagine it’s even more confusing/frustrating for the new or casual rider.